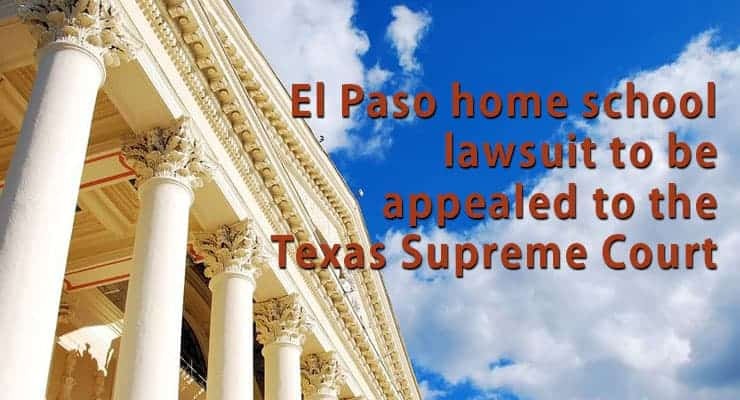 A few weeks ago an El Paso appellate court ruled against a home school family in their civil suit against a local school district. Last month I posted a review and discussion of the El Paso ruling and how it impacts home schoolers. The family that filed that suit contacted me and asked that I clarify and/or correct some of the comments I made in regard to the case. After a lengthy discussion and review of the facts surrounding the case, I agreed to do so. There is no question that El Paso ISD has a reputation for aggressive actions against home school families as it was a named party to the Leeper lawsuit in the 1980s. The McIntyres were first contacted by El Paso ISD in 2006. They responded to that inquiry by a phone call to confirm to district officials that they were indeed teaching their children at home. The second contact from El Paso ISD in January of 2007 was the result of the complaint by family members. After visits to their home from school officials, the McIntyres were advised by Home School Legal Defense Association (HSLDA) not to sign the district’s form as requested. Instead, HSLDA responded with a letter to the district asserting that the family was in compliance with the law. Later when officials demanded a face to face meeting, HSLDA recommended they not comply and sent a second letter to the district in which it threatened civil action against the district. A few weeks later, the district filed truancy charges against the McIntyres and their children. HSLDA referred them to an attorney retained by HSLDA who represented them in the truancy case. Later, according to both the McIntyres and HSLDA, the same attorney as well as two others were hired by the family to represent them in a civil suit against El Paso ISD officials. This was the kind of suit previously threatened by HSLDA. The civil suit alleged harassment of the family by the school district and others. The McIntyres disclosed they have spent almost $400,000 in court costs and legal fees in this case to date, and they plan to appeal it to the Texas Supreme Court. Read the brief supporting their appeal at the El Paso Court of Appeals. The McIntyres expressed that they were encouraged to file the civil suit as a means of forcing the district to drop its criminal truancy charges against them. Court records indicate that the District Attorney offered to drop the charges if the family would provide an assurance letter. The family refused to do so, based on the advice they had been given. The truancy charges were eventually dropped in November of 2007 (after the civil suit was filed) for the stated reason that the witness (a daughter of the family) was not willing to testify in support of the charges. The McIntyres clearly followed the advice they had received in a good faith effort to do what was best for their family. HSLDA’s counsel was based on the case law that established home schooling as legal in Texas in 1994. THSC’s procedure for handling cases like this differs because we address issues from not only a legal, but also a state policy perspective. Watch for my next post on the Texas policy that is the basis for the freedom parents have to educate their own kids today. I know this family personally – I am head of the homeschool ministry that they have belonged to for the last 10 years. We have gone and sat with them as then endured court date after court date and have prayed for them for years as they have gone through this. They are persons of good character. Loving, kind and generous to the ministry and me personally. I know that when these things happen, people tend to choose to “believe the evil thing” first – so I just wanted to put this description out there for people to add to what they are hearing. The McIntyres are good people of strong faith and are holding up well under the strain. Thank you so much for taking the time and effort to take this case to finality. Most people don’t have the ability or means to do what is necessary to prevent these districts from continuing this illegal intrusion into homeschool families lives. After reading Tim’s first article concerning this case, I posted a comment in support of this family and their actions. I do not know them but I know my observations of the political climate in which we currently live. Rush Limbaugh was among the first high profile figures–in the 90’s–that I recall pointing out and warning of the dangers of the attitude that is characterized by “we must investigate because of the seriousness of the charge.” Basically, the assumption of innocence is thrown out because of the “seriousness of the charge.” That opens the door very wide for abuse. One only needs to make a “serious charge” to unjustly do serious damage to someone they simply don’t like i.e. Travis county DA filing erroneous charges against Rick Perry. To date, in my estimation, there has been very little accountability for such abuses. Government agents have run roughshod over people with no repercussions. They simply claim “we were just doing our job” even though they may have ruined an innocent persons life. It appears to me that the McIntyres along with HSLDA are simply demanding that El Paso ISD officials be held accountable. I applaud their efforts. You said the HS family was appealing this case but their brief is the Appellee’s brief. It appears the school district is appealing the trial court’s summary judgment ruling in favor of the family. The brief was what they filed at the appellate level in which the school district was indeed appealing the trial courts ruling. They are appealing the appellate courts ruling to the Texas Supreme Court. LindaD. Could you give a link to the Appeals Court ruling? Having been in a court over three years, because of parental rights, my sympathy goes out to the McIntyre parents and family. I thank God for their courage which will prevail. Thank you, Tim, for persevering in their behalf. I shall be reading and praying to The Lord who has given us victory through a settlement order recently. No one knows the best interest of the child, except the parents. Thanks, Troxel. Linda, There is a link to the appellate court opinion in the first posting about this case. There is a link to the appellate court opinion in the first posting about this case. Tim, we need more lawyers like you. What are you doing to develop lawyers who can replace you as you approach your senior years, so that you can be an expert to these developing lawyers instead of having to handle everything yourself? What will Texas Home School Coalition be without YOU? We need you to clone and multiply, Brother. I ran across an article about homeschooling, and it was crazy but there was a commentor that referenced this case in particular. It was not a supportive comment either. How does the ElPaso school district have the extra money to keep sueing these people, when they obviously can not force public school attendance? That would be an interesting article. I wonder how much money the district has spent on this case. Its not uncommon for home school detractors and opponents to take stories or lawsuits and try to make home schoolers look bad. School districts are government entities that use taxpayer dollars to pay their attorney fees. In fairness, I should note that the district was responding to the lawsuit filed by the family and they appealed because they lost at the local level. If the family has spent $400,000 of their own money you can bet the district has spent at least that much.